Italian promoter OPI 2000 have announced that due to television problems they will now promote two EBU title fights, originally headliners on separate shows, on the same bill. This means that the clash for the vacant jr welter title between Michele Di Rocco and Lenny Daws and Mohamed Ali Ndiaye vs Christophe Rebrasse for the vacant supermiddle crown will go ahead June 8 with site to be announced. Di Rocco vs Daws was first set for May 18 while Ndiaye vs Rebrasse was on for May 24. Lightheavy Dominic Boesel, 14-0, makes the first defence of the WBO Youth title June 14 in Weissenfels, Germany, in the headliner of a SES promotion. Boesel (pictured) takes on fellow German Chris Mafuta, 12-3. Also on the bill are other SES prospects such as cruiser Dennis Ronert, supermiddle Moritz Stahl and jr welter Felix Lamm. The clash for the vacant EU supermiddle title between Hadillah Mohoumedi and Giovanni De Carolis that was set for May 17 in Rome is postponed as De Carolis have suffered an injury in training. The fight promoted by Round Zero - will now go ahead in June with exact date to be announced. 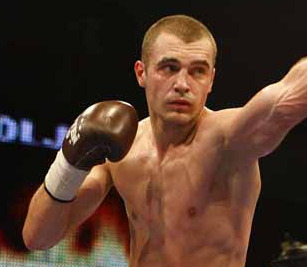 The EE-EU, a rather obscure title subtitle under EBU control open for non-EU fighters, is stake June 8 in Ascona, Switzerland when Serbian Vuk Mitic take on Vitaly Kopilenko, based in Switzerland but from Ukraine, for the vacant middleweight title. The fight is staged by Michele Barra.